Rougepout Beauty: Superdrug Optimum Eye Cream - hoping for optimum results. Superdrug Optimum Eye Cream - hoping for optimum results. 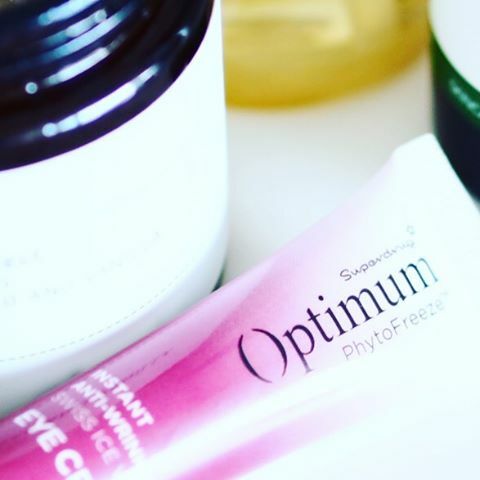 Hoping for the Optimum results from this PhytoFreeze Eye Cream from the Superdrug own brand range. Before I get into the specific details about this product I had noticed the areas under the orbital bone beneath my eyes were crisscrossed, dehydrated, this was especially noticeable around my right eye. It is a problem that has been ongoing for quite some time and I have often found specific eye products actually make the problem worse. After two applications, I noticed the area had improved, because I'm so cynical about eye products, this isn't something I would have believed had I read it elsewhere. Certainly, the criss-cross area had lessened and particularly the right eye area which is often the more obvious of the two. My preference of application is to place a pea sized amount on the back of my hand and pat the product around the orbital bone using my ring finger. The packaging of the product has a useful metal and super cooling applicator to aid application and also it works a treat for puffy eyes and allergy issues, I just prefer to use my fingers and I feel for me the product is placed better in the areas needed. Using a unique active ingredient based on Swiss Ice Wine to immediately tighten and intensely moisturise the eye area, these sugars and polysaccharides work to freshen the skin from the first application. With elastin stimulants helping the fight against gravity, vitamin e and olive oil to add more hydration, this has been a tube that I have both my eyes on, could this finally be the one? This is an ongoing product for me and I don't feel that a final review can be complete until I am at least half the year using this, the reason being, I generally become so disillusioned with eye creams that after a couple of months I can can't see the light at the end of the tunnel or a massive change, so I stop and don't use a specific product. Superdrug Optimum Eye Cream is still sitting in my bathroom and being used, I haven't yet had that 'meh' feeling, which is extremely rare. I rather like the gentle cream, it is balm like which I prefer and it blends away, but I am aware of my skin looking less strained and marked. I am aware that my reliance on just my oils, serums and moisturisers to do the job are not always the best choices and can be too heavy for the area, too rich or just drying. So, this is a huge success for me, an eye product that continues to give, great to use am and pm.